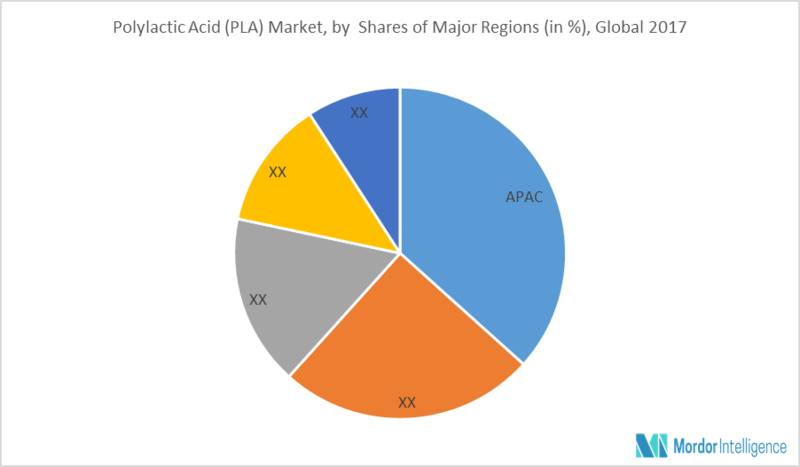 The global polylactic acid (PLA) market valued at USD 698.27 million, by revenue, in 2017, and it is anticipated to reach USD 2,091.29 million by 2023, at an estimated CAGR of 20.06% over the forecast period. Key factors driving the market growth include, favorable government policies promoting bio-plastics, and increasing demand for bio-plastic packaging. Polylactic acid is prepared by ring opening polymerization of lactide, with various metal catalysts in solution, melt, or suspension. It can also be prepared by direct condensation of lactic acid monomers. Polylactic acid demand is expected to increase, due to the scarcity and volatility of prices of fossil fuels. Also, due to environmental concerns, companies and regulatory bodies are focused on finding substitutes for oil-based products. Bio-based plastics have a huge potential to reduce consumption and dependence on petroleum-based feedstock, and lessen negative impact on environment, by reducing carbon footprints. However, the market faces few challenges, such as price competitiveness and availability of cheaper alternatives, and difficulty in disposal of PLA. Globally, shoppers use around 500 billion single-use plastic bags every year, and this number continues to rise. Petroleum-based plastics are a major source of global pollution. Many countries across the world have banned the use of lightweight, single-use plastic bags, or have started taxing it. In addition, consumers are also becoming more concerned toward the environmental impact of plastic packaging solutions. PLA provides the packaging industry with a renewable sustainable option for a variety of uses. Many of these include flexible packaging films made form PLA resin. The combination of desirable properties, such as high clarity, stiffness, and excellent printability, along with ease of processing PLA in the existing infrastructure, drives the demand for PLA in the eco-friendly and advanced packaging segment. The huge benefit of PLA as a bio-plastic is its versatility, supported by its natural degradability when exposed to the environment. For example, a PLA bottle left in the ocean would typically degrade in six to 24 months. Accordingly, there is a high potential for PLA to be very useful in short lifespan applications, where biodegradability is highly beneficial. In terms of volume, the market is expected to be 286.37 kilo metric ton in 2017, and is anticipated to reach 830.1 kilo metric ton by 2023, at an estimated CAGR of 19.48%. The market has been segmented on the basis of raw material, form, and end-user industry. By raw material, corn starch is expected to dominate the global market. By form, films and sheets are expected to dominate the market. By region, North America has dominated the market in the past years, and it is expected to have the largest market share over the forecast period, with an estimated CAGR of 19.48%. Asia-Pacific is estimated to have the highest CAGR 21.89% over the forecast period. By end-user industry, packaging industry has the highest market share, and is expected to dominate the market by volume over the forecast period, with an estimated CAGR of 19.65%. Medical, textiles, and agriculture are the other end-user industries, which are likely to have higher CAGR over the forecast period, due to the increasing applications. January 2018: Bengbu-based BBCA Group signed an agreement with Glactic Company, located in Belgium, on a PLA (polylactic acid) cooperation project, featuring a designed annual production capacity of 100,000 metric ton. January 2018: Engineers from the University of Connecticut developed an implantable sensor, made from poly (L-lactide) (PLLA), a medically-safe biodegradable polymer that can measure even very small changes in pressure inside organs. June 2017: NatureWorks signed a contract to license Plaxica's Optipure chemical processing technology for the production of D-lactic acid, which serves as a building block for Ingeo PLA grades. Major Players: BASF SE, NatureWorks, Mitsubishi Chemical, DowDuPont, Eastman Chemicals, Bayer, Corbion, Danimer Scientific, amongst others.